It’s always easier to tell a story when it’s over, when you’ve arrived at a place recognizable as a destination, to have things tidily wrapped up despite whatever struggle or confusion might have preceded it, to know what it was all about, what it means. This isn’t one of those stories. Emily Fox King is at what Dante called the middle of life’s walk, so nothing’s wrapped up, no conclusions have been made. She’s at a point that is as much about looking forward as looking back. King lives in a mid-century rambler not far from the campus of Weber State University. In the yard, a tricycle, a broken light saber and a plastic box full of rice and small toys (a safe alternative to a sandbox) attest to the presence of her young children. Two are rumbling around inside. A third is at school. A finger painting, done by the youngest, hangs above the couch, where it was hastily pinned up to replace one of King’s own paintings, now hanging at the Alice Gallery in Salt Lake City. Florescentia, King’s exhibit of new works, fills the intimate space on South Temple with a riot of color — paint swirled, scraped and jabbed across canvas to form a score of overflowing floral motifs. Many are 4 feet or more in either dimension, so the flowers are larger than life, threatening to overpower the viewer with visual stimuli. 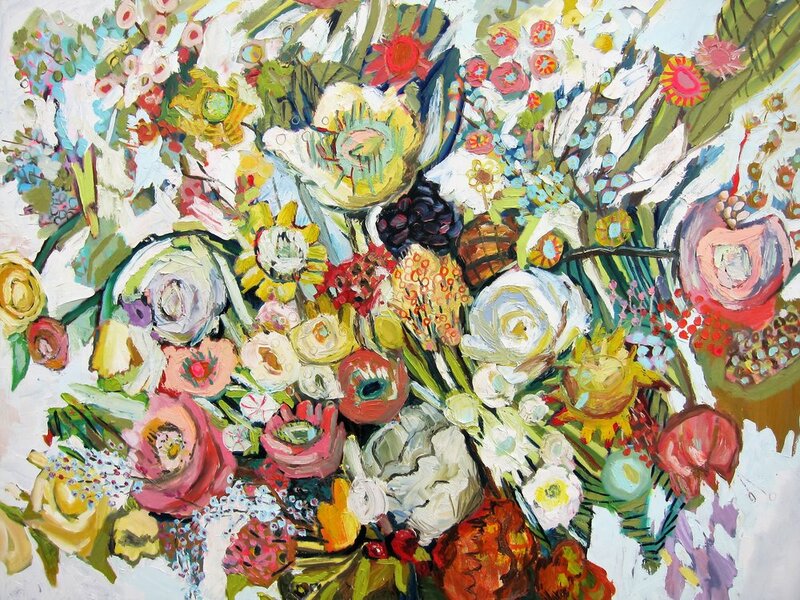 Yet, dramatic as their execution might be, these are floral paintings. One might be tempted to add “just.” Not exactly cutting edge. Nor the type of work you might expect from King if you came across her at BYU. As she pursued her MFA in the late aughts, King was doing a lot of work in new media like video, performance and installation. Her pieces explored traditional notions of femininity, like her ironic video works that featured beauty pageants, ballet, sewing, synchronized swimming and pastries, or her final MFA show in 2010, Fabricating Womanhood, an installation of a human-size dollhouse. The work was well received by her peers and she continued to feel affirmation for what she had done when, after graduation, she would return to campus and people would remember her work and compliment her on it. 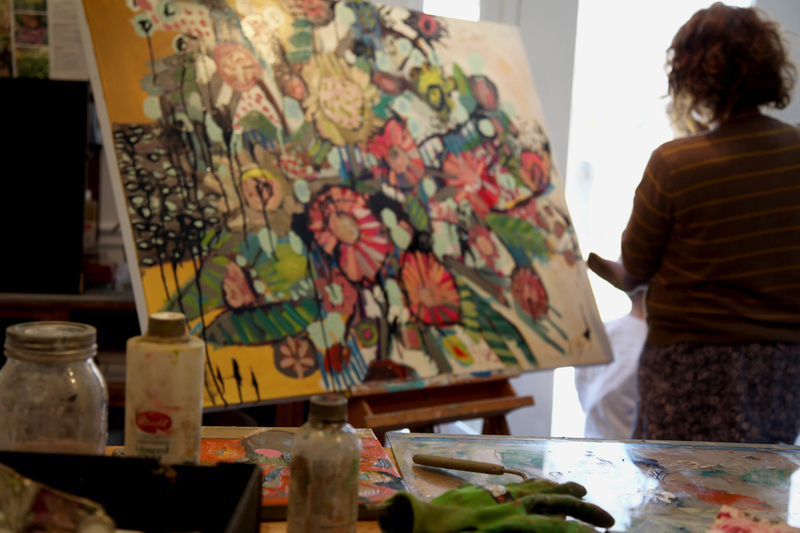 Once out of school, King moved to Salt Lake City, where she taught at Indian Hills Elementary, on Salt Lake City’s East Bench, before driving UMOCA’s art truck for two years. Artistically, she says she was “dinking around.” She returned to her first love, painting, with an exhibition at Sweet Branch Library called Princess Religion. Her description of one work — “a buxom Disney princess with her Mormon Disney-castle wedding” — gives a sense of the satirical approach she was taking as she examined the life around her in her late 20s: people from her community obsessed with money, makeup and plastic surgery. Though the works employed a more traditional medium, they continued the trajectory of her MFA work, exploring issues of female identity. King grew up in the Tri-Cities area of Washington state, LDS, the middle of seven children. She had what she describes as “disordered eating” — not full-blown bulimia or anorexia, but body- image issues. Though she loved dance, for instance, at 12 she realized she would never have the body of a ballerina and gave it up. Her parents both worked with their hands — her mother is an artist, her father a surgeon — but, too busy playing bass in jazz band, King had skipped art in high school. When she went to Western Washington University, however, she knew that’s what she wanted to study. 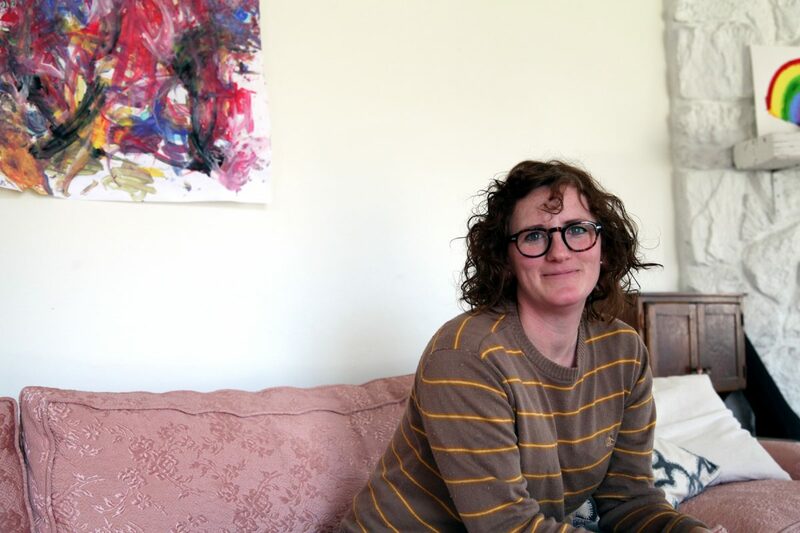 She concentrated on painting for most of her four years until she discovered printmaking her last semester, which spurred her to pursue graduate work at BYU. That’s where she took up installation and video work. “Parmelie Comptois,” 2018, Oil on Canvas, 48 x 60 in. 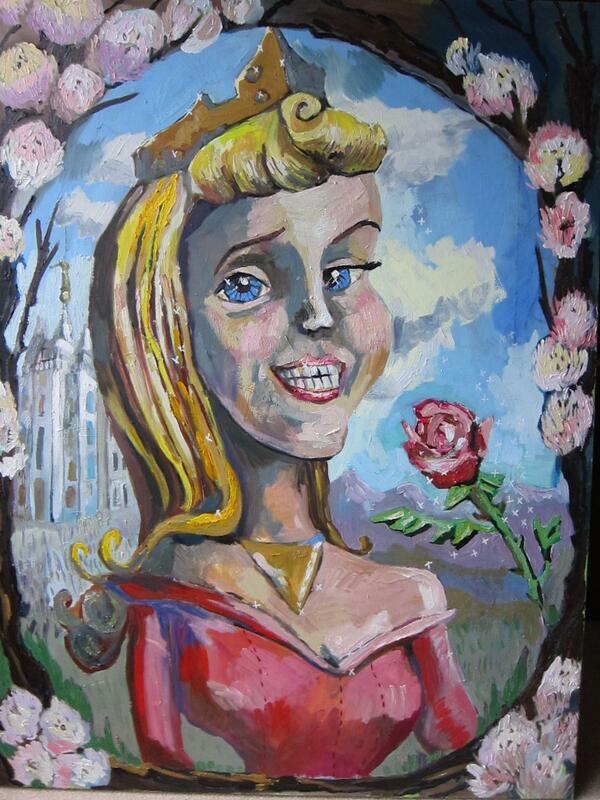 King worked in a florist shop one summer after moving to Ogden, so she’s been around plenty of flowers. But, botanists beware, she’s no literalist. 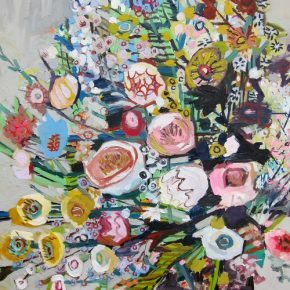 These are approximations of flowers, “inspired by,” “based on.” She works from found photographs mostly, using them to get herself started, but then the paint takes on a life of its own. 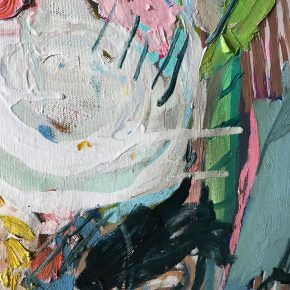 Some species may be recognizable, but King has assumed the role of Mother Nature, developing new genera if she needs an excuse to streak some ultramarine blue across the canvas, or work up a swirl of magenta. One of the works at the Alice seems more muted than the rest, washes of black and gray infused in the painting, as if decay has begun to set in. 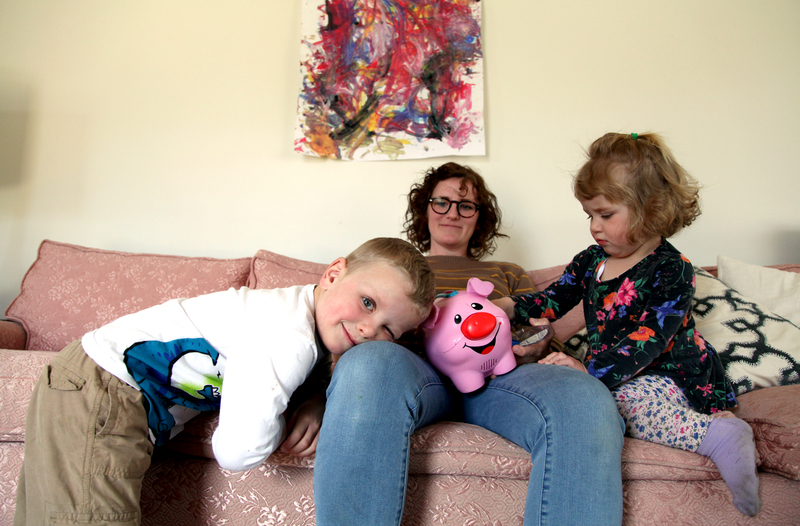 Her husband came up with the title: “Bitumen.” “It’s kind of messy,” she says. “I like the idea of pretty flowers, but underneath it, I want to put some grit in it.” This tendency to go dark has characterized her career. “My mom is like, ‘Why can’t you just make something nice.’” Even during her undergrad she was “always doing people with scary teeth, a lady holding a dead chicken, fat ballerinas.” Those days seem to be part of the past, however. While some grit may remain, one suspects the anger is gone. 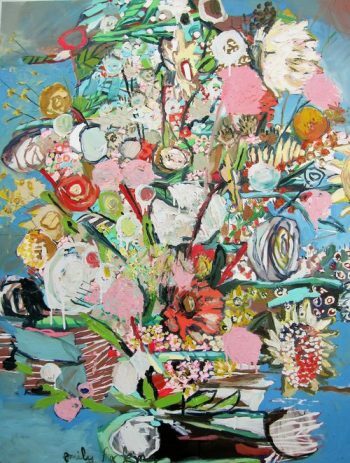 Florescentia, works by Emily Fox King, Alice Gallery, Salt Lake City, through May 4.